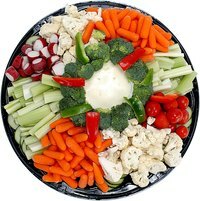 Party platters provide colorful and artistic arrangements of finger food, but they can be expensive when you buy them from grocery stores, delis or caterers. Party planners accept the inevitability of doling out large sums of money for prepared munchies -- to be sure, it's convenient -- but the frugal host can put together beautiful party platters for much less money. Create your own serving platters rather than buying or renting them from party supply houses: Cover large pizza pans in aluminum foil and, for a color effect, cover the foil with tinted plastic wrap. Secure these wraps on the bottom of the platter with masking tape. You probably already have a few pizza pans in your kitchen, but if you need more, borrow from friends. You could otherwise make platters from large cardboard cake rounds, covering them the same as above. Buy your party foods from a bulk warehouse. Bulk prices are lower than those in grocery stores. If a bulk warehouse is not nearby, shop at a large discount store with grocery and deli departments. Always compare these discounted prices to grocery stores for each item. Neighborhood grocery stores sometimes run specials that can take the price of an item down below that of bulk warehouses. If you frequent such a corner market and have a relationship with its proprietors, you might let them know you're hoping to set a record for cost cutting and see what develops. Use fruits and vegetables that are in season whenever possible. In-season prices are lower due to their availability. Oranges and other citrus fruits, carrots and cauliflower are in season during the winter; tomatoes, zucchini, cherries and corn are good summer choices. Consider visiting the farmer's market a day or two before your event, and clean, cut and prepare all your fruits and veggies yourself -- it'll save money and keep the food crisp. Add a couple of cheese choices to a fruit platter, along with an assortment of crackers. Cheese is expensive, but if smaller portions are offered alongside other foods on the same platter, the small amount will not be as noticeable -- unless your guests eat it all up early. Buy your cheese in blocks or wheels and cut them yourself. You'll save big money and you'll get a workout. Make your own homemade chicken salad, tuna salad and pimiento cheese sandwiches to keep costs down. Alongside or instead of finger sandwiches, you can serve these fillings as trendy crostini by spooning them atop baguette rounds that have been brushed with olive oil and toasted. Go retro with inexpensive party foods from the past. Fill your platters with rumaki, pigs in blankets, deviled eggs and Swedish meatballs. Find these recipes and more online. Serve like foods on platters together, or consider mixing trays smorgasbord-style if you'll have servers carrying them.